Oh hey there, book nerds! I have always been an avid reader, but had never really set “reading goals” for myself until last year. I didn’t have any sort of tracking method until the latter part of the year though; I think I just barely fell short of my 2018 goal, but there’s no way to tell, really. So, I’m making it a little more official this year by putting my Goodreads account to use, and by manually tracking my completed books each month in my bullet journal. My goal is to read at least 52 books in 2019, and I thought now would be as good a time as any to catch you up on how that’s been going for me. 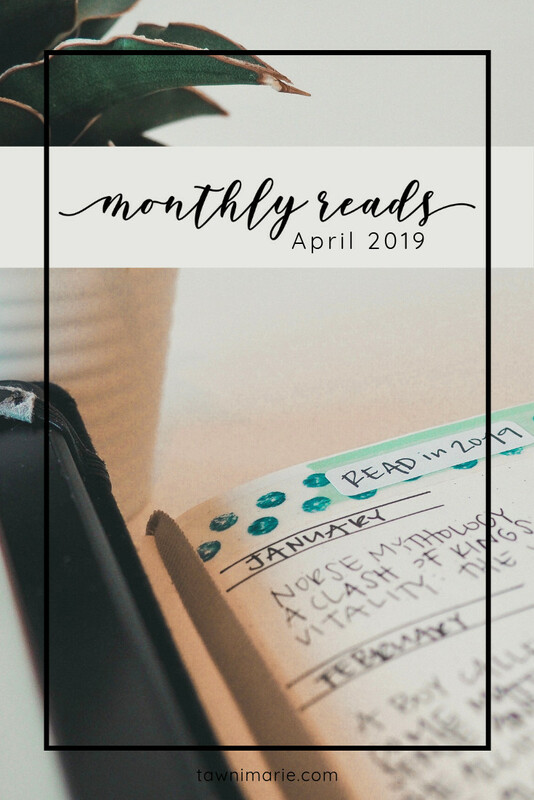 My intention is to update you each month too, on my monthly reads (hence the clever title of this post, heh). Before we look at the current month though, let me bring you up to speed. Norse Mythology by Neil Gaiman, 3/5 stars. I mean, it was okay. It was entertaining, so it served its purpose, I suppose. I'm in the minority though on this one – it averages about 4.5 stars on Goodreads and Amazon. A Clash of Kings by George R R Martin, 4/5 stars. My fifth star carries a lot of weight. If I wasn't so weird about my fifth star, this book would probably have gotten it. It's the second book in the A Song of Ice and Fire series, and it was intense, to say the least. It averages about 4.5 stars on Goodreads and Amazon. Vitality: The Young Living Lifestyle by Jen O'Sullivan, 4/5 stars. For what this book is, it's written and put together really well. It's a perfect book for anyone who's interested in learning more about what essential oils can do for your body, and how they work in your systems. There are expert tips and advice throughout as well, and the author is one of the few "authorities" on the subject whom I actually trust. The book averages about 5 stars on Goodreads and Amazon. A Boy Called Christmas by Matt Haig, 5/5 stars. (Reread.) I read this book out loud to our boys during the Christmas season of 2017 and again this past Christmas season (2018), but this time it took us until February 2019 to finish it. Oops. It's a charming, witty story with a lot of hidden life lessons thrown in. It's definitely worth the time and sore throat you'll get from reading aloud every year. It averages about 4 stars on Goodreads and Amazon. Come Matter Here by Hannah Brencher, 3/5 stars. Look. Listen. I am not typically a fan of books written by Christian women for Christian women. More often than not, I'm unable to connect or relate to the author's experience or story, and/or I feel like the author's voice is inauthentic; I don't appreciate fluff and "Christianese." This book started off really strong for me, and I was hopeful, but it lost its steam somewhere towards the middle and I was never able to get back into it. I gave it 3 out of 5 stars because I really respect the author and appreciated the vulnerability and truth in her writing, but it fell short for me overall. This is another one I'm in the minority on – it averages about 5 stars on Goodreads and Amazon. Sense and Sensibility by Jane Austen, 4/5 stars. (Reread.) It's not my favorite Austen book, but it is so witty and such a pleasure to read, and I had fun trying to guess each character's Enneagram number as I read. Sense and Sensibility averages about 4.5 stars on Goodreads and Amazon. The Accidental Further Adventures of the Hundred-Year-Old Man by Jonas Jonasson, 3/5 stars. This book was really cute, but not nearly as cute as its predecessor, The Hundred-Year-Old Man Who Climbed Out of the Window and Disappeared. which got an easy 5/5 stars from me. Jonas Jonasson’s writing style is bold, relevant, and a lot of fun, and he’s become one of my new favorite authors. The Accidental Adventures averages about 4 stars on Goodreads and Amazon. The Alchemist by Paulo Coelho, 5/5 stars. (Reread.) I think I might make The Alchemist a yearly read. This was my third time reading it, and it hasn’t failed to inspire me once. It’s so good. And I’m not the only one who thinks so – The Alchemist averages 4-5 stars on Goodreads and Amazon. A Good Man Is Hard to Find and Other Stories by Flannery O’Connor, 3/5 stars. Yikes. I appreciated the writing style, and I enjoyed the suspense of each story as I read; I completely understand that the author was way ahead of her time and was incredibly bold to write how and what she wrote (especially as a woman (gasp! ), and a Catholic woman in the bible belt of America in the ‘50s, no less), but you have to admit that the stories in this collection are not timeless, and for that reason I can’t give it more than 3 stars. Sorry. Maybe I’m not alone; this collection of short stories averages 4 stars on Goodreads and Amazon. How to Stop Time by Matt Haig, 5/5 stars. What. A. Treat. After rereading A Boy Called Christmas and loving it all over again, it hit me that Matt Haig doesn't only write children's books. I happened to find How to Stop Time at a local bookstore and bought it thinking it'd make a good airplane read. It was so good. It was witty, perceptive, and unlike anything I've ever read before. If you or someone you love struggles with anxiety, you'll appreciate the author's insights throughout the story. It's written brilliantly and has a sort of peace about it. How to Stop Time averages about 4 stars on Goodreads and Amazon. Releasing Emotional Patterns with Essential Oils by Carolyn L Mein, 3/5 stars. It was alright. For what the book is, it serves its purpose. I didn't expect to be blown away by this one, anyway. It was informative – I did learn quite a bit – but it was also very, very dated. Others have evidently been slightly more impressed – the book averages about 4.5 stars on Goodreads and Amazon. Since I’m usually reading at least two books at a time, some books take longer to read than others. I used to never read more than one book at a time, but I've found it to be so much more enjoyable now, especially if I'm reading a particularly long book and just can't wait to start another story. As long as I keep the genres different between the books I'm reading, and especially when I throw a non-fiction book in, I never mix up the storylines and haven't gotten confused or lost… yet. So that being said, here's my lineup for April. Two of the books are nearly finished already, and I was really tempted to slip them onto the list for March, but I'm not here to lie. They'll be finished probably within the first couple of days of April, if I haven't finished them already by the time this post is published. 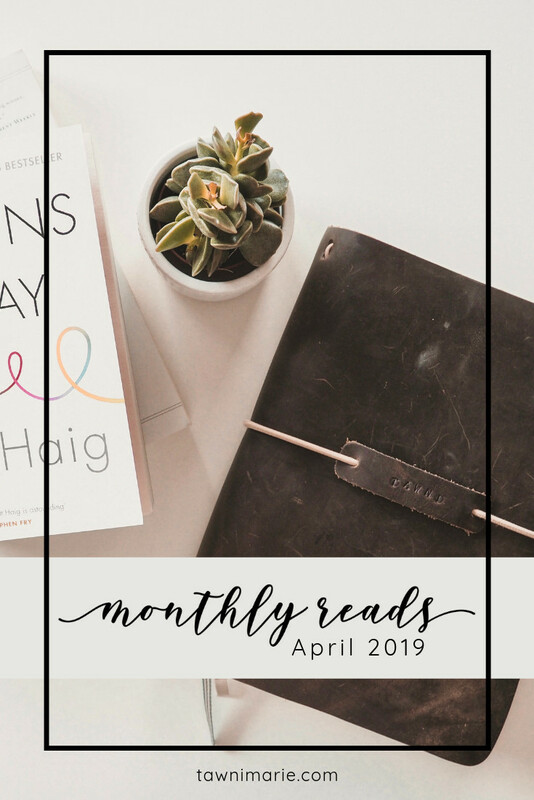 If you've read any of the books in my April lineup, let me know how many stars (out of 5) you'd rate them! I can tell you already that Pride and Prejudice is a 5-star book for me, and since I'm nearly finished with A Storm of Swords I can say with some confidence that it'll get 5 stars from me, too. One last thing. Another fun habit I've started in my bullet journal is to log my favorite quotes from books I read. As I read in a "real" book, I'll just take a snapshot of quotes with my phone, and will then log the quotes into my journal later. And as I read on my Kindle, I'll highlight the quotes I like, then log them later as well. I only started logging quotes in March, so the journal isn't quite as full as it could be, but I think it will be a lot of fun to go back through the quotes later (and often), to sort of re-inspire myself.